Home > Woodworking	> Why hand tools? Woodworkers can be solitary creatures and often for very good reason….pounding hammers, screaming routers and endless dust from a planer is not inviting. We often look for the solitude but we also have a need to share our experience and gain knowledge from others. In the beginning of this year I began a process of moving into hand tool work. Thanks to Shannon Rogers and his Hand Tool School I am getting in touch with my tools and have a better feel for the wood that I am working. The greatest benefit though is the occasional visitor to my shop. My 11 year old daughter takes the time to sit near me while I square a board and talk about her day at school, often helping me find a tool and commenting on my progress. 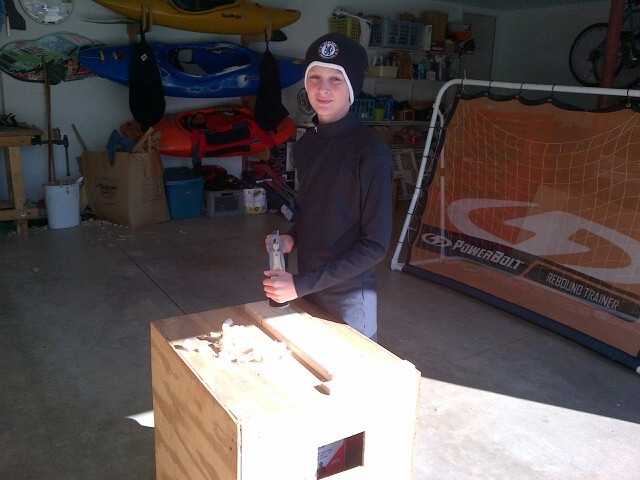 My 13 year old son has even taken time out from soccer and computer games to plane a board and measure progress by the pile of shavings. I converted a cabinet for him to hold wood and he even has his own 5 1/4 plane. So for all of my power tool friends, have at it, enjoy the fast progress, conquer the tree, but for myself, except for the most arduous tasks,I prefer the sound of little voices and the swish of a 5 1/4 plane next to me. Tongue and Groove Handsaws anyone?